Here you will find the most up to date happenings with the Patawomeck Indians. RULES AND REGULATIONS FOR PATAWOMECK BAND PARK! The Patawomeck Tribe was asked to participate in the Economic Landscapes of the Tidewater: An Institute for Teachers of VA and US History held at Stratford Hall in Westmoreland County, VA. The conference was held to prepare the teachers better for the required SOL testing. The teachers had very old information about the first Native Americans encountered by the colonists back in the 1600s, still thought there was only 8 tribes recognized in VA, and were very interested in our Tribal Members demonstrations and hung onto every word from Lesser Chief Gary Cooke's stories. We have been invited back to next year's conference. Virginia State Delegate William Howell attended the Monthly Council Meeting to present to the Council the Official Resolution granting the Patawomeck Indians State Recognition. 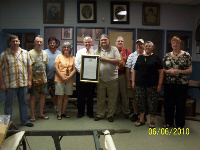 The Resolution can be seen on display at the White Oak Civil War Museum, located at 985 White Oak Road.